The fact that only two secessionist movements have translated into statehood in the political history of post-colonial Africa should not necessarily be seen as the triumph of the uti possidetis rule. From a statistical perspective, it could be argued that this principle has successfully prevented the balkanisation of the continent. However, the impact of the conflicts over secession on the stability of the affected states cannot be under-emphasised. High death toll, displacement of persons, wrecked infrastructure, enhanced insecurity and zero development are some of the issues that highlight the need to pay serious attention to the factors that underline secessionist claims. On the one hand, from an historical perspective, some of the secessionist demands are very valid and cannot, therefore, be easily dismissed. On the other hand, the hard realities of statehood, such as the much needed technocratic skills, economic viability and security issues may render the secessionist demand for statehood unfeasible. In this respect, the task is to ensure the effective balancing of secessionist demands and continued stability/survival of affected nation-states. This balancing will require that adequate attention is paid to matters such as marginalisation and exclusion, lack of development, the demand for (con) federalism, good governance, better (political) representation, and cultural and fundamental human rights. Ethiopia provides a good example as it provides its ethnic units “unconditional right to self-determination, including the right to secession”- Art. 39(1) of the Constitution of the Federal Democratic Republic of Ethiopia.This is not to suggest that African countries should incorporate the “right to secession” in their constitutions, rather it points to the necessity of creating a milieu that promotes greater autonomy and quality self-governance. 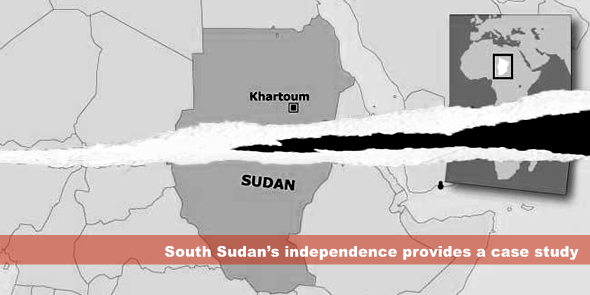 South Sudan’s independence provides a case study and inspiration for other secessionist movements across the continent. Whether or not it opens the floodgate for the creation of more states in Africa is not as important as understanding the issues that enhances the position of secessionists. The viability and/or stability of states affected by secessionism hugely depends on their ability to craft a politico-legal and economic framework for addressing such demands. Dr Babatunde Fagbayibo is a Senior Lecturer in the Department of Public, Constitutional and International law at the University of South Africa. His research interests include public international law, regional integration, the African Union and international politics. Great piece!!! Secession should be considered as a very last resort and not the primary resort to an identity crises. How do we therefore redraw colonial boarders? Should sleeping dogs lie, and we focus more on institutional arrangements like appropriate federalism, which keeps a diverse country intact? Great effort!! One human right pivotal to Africa’s political development and which is largely misunderstood is self-determination. Another doctrine ‘largely’ detrimental to Africa’s political development is uti possidetis. In order to reap the various fruits of self-determination, it is important in this age of human rights to develop creative exceptions to uti possidetis and may be replace it with a more human right-centred concept of territorial integrity. At independence, colonial entities in Africa became sovereign and independent states thereby succeding to territories handed over to them by their respective overlords, and by a long standing rule of international law, sovereign states enjoy territorial integrity. Can’t this concept of territorial integrity achieve the two benefits of uti possidentis cited above while also allowing justifiable claims of self determination to flourish through pacific means? Uti possidetis has been violated in the Eritrean and Sudanese cases and will continue to be violated in the future. My view is that creative exceptions ought to be developed and supported by all in order to mitigate the overbearing effect of uti possidetis on legitimate claims for self determination (sessession inclusive). A piece well written!it is just unfortunate that players in the international circle with regards to self dermination and the doctrine of uti.possi.detis have and will continue to disregard the rules.self determination in the case of south sudan was justified and i believe if both parties are committed to peace,then it is achievable!.but no matter how perfect and suitable the laws and agreements we make are if the players do not play to the rules,then this problem would not go away. To me, these exercises were more like marriages of convenience. sown by these marriages of convenience; if this can prevent wanton bloodshed. Interesting piece! Only that the case of Eritrea is not that of a problem of arbitrarily imposed colonial boundaries nor can it make a case of an exception to uit possidetis; so it cannot be compared to the case of South Sudan in this regard.I stronlgy agree that South Sudan provides a case study to draw lessons in the effort of harmonising self determination with uti possidetis. The reference to Eritrea was done within the context of a continental policy that discourages the emergence of new states. Although the historical dimension of Eritrea’s quest for statehood may be different from that of South Sudan, the fact remains that if there had been no cordial relationship between Aferwerki and Zenawi, the OAU would have denied Eritrea the recognition it needed. Such refusal of recognition would have been carried out within the context of uti possidetis and not on the basis of history. Thank you for this post and my apologies for a slightly belated reaction. I would only like to add that uti possidetis should not be seen as a continuous principle. It is applied in the moment of decolonisation. At that time the principle confines the new international border. However, if a secession-seeking entity cannot achieve independence later, this is not because uti possidetis would continue to apply. It is rather that a former colonial territory is now an independent state and, as such, protected by the principle of territorial integrity. Outside of colonialism the principle of territorial integrity limits the right of self-determination and the latter only very rarely and exceptionally leads to the emergence of a new state. In essence, if entities nowadays (in Africa and elsewhere) cannot emerge as independent states, this is because of the applicability of the principle of territorial integrity, not uti possidetis. My second comment is on the constitutional right to secession. Such a right was also elaborated in Article 72 of the Soviet Constitution and invoked in the preamble of the Yugoslav constitution. In practice, however, such a constitutional right is of little value if no domestic legal instrument creates a mechanism for secession. How is the constitutional right to independence triggered and consummated? Normally through independence referenda. But who is entitled to vote at such a referendum? What type of majority is required? How is the referendum question phrased? These are some difficult issues that arise before independence referenda are held and can indeed determine whether or not the will of the people would favour independence. In essence, even where a constitutional right to independence, in principle, exists there is still a long way to independence as the referendum rules still need to be negotiated and can be written in the way that de facto prevents achieving the prescribed majority. It is thus perhaps not surprising that the former Soviet and Yugoslav republics did not become independent in pursuance of their constitutional rights to independence. I think this is what we need to keep in mind wherever we see a constitution that – seemingly generously – grants a right to independence. dentysta Radom. This was funny stomatolog Radom. Keep on posting!